ETI0001-1473 does not require a separate PDU since the PDUfunctions are already integrated into the UPS module. This saves rack space, cabling andexpense while improving overall reliability. The heavy-duty chassis, occupying only 5.25”(3U) for the electronics and 3.5" (2U) for the optionalbattery module by 22” depth,delivers up to 2000 VA of clean, uninterruptible power. Therounded metal corners and rugged handles, both front and rear, aid in safehandling. Internally, all major components are well secured and electricallyinsulated to prevent damage due to shock and vibration in any axis. The standard version accepts domesticvoltages from 85-135 VAC at full load. At loads less than full load, the input voltage can be even lower. The optional global input version has autoranging from 85-270 VAC (CONUS and OCONUS) utilizing an internal input transformer. When ordering the global version, the inputcircuit breaker and the galvanic isolation transformerprovide a double pole isolated source for overseas locations where phase references and grounding are not consistent. ETI0001-1473 has the added benefit of having an internally redundant 24 VDC DC power source output. The LED arrays keep the operatorinformed as to the unit's status including load and battery levels. The Elapsed Time Indicator records the number of operational hours for records and scheduling preventative maintenance of attached equipment. The front and rear panels also provide easy access to both the AC Input and Battery Input fuses. Coupled with the adjacent spare fuses, MTTR is reduced to less than 15 minutes. The internal intelligent thermalsensors provide two stage monitoring of unit temperatures,with both local andremote Inhibit Over Temperature (INHIBIT OVRTMP) capability of thermal shutdown. INHIBIT OVRTMP can beengaged via the front panel control, via a remote contact input or via asoftware command. When in INHIBIT OVRTMP, an audible alarm is sounded and anindicator is lit. The high intensity audible alarm can be heard in high noise environments and includes an audible enable/disable/reset switch and an adjustable vane to control the sound level. All controls and protective devices are brought to the front and rear panels with critical switches or breakers guarded. Further, all front panel devices are recessed to prevent damage or accidental operation. The internal intelligent PDU allows control of the individual output circuits incorporating thermal and interlock interfaces for additional control and safety. Ten push/pullcircuit breakers provide both circuit protection and manual controls. Both the input and load circuit breakers are shock rated to over 100 Gs. The display andcontrol panel can be mounted remotely in the rack at eye level, or on the keyboard console,or on the unit front panel with only a logic level cable connection. The rear panel provides locking connectors for the input and output power with various optional configurations available. Thisunit draws air through the front air filter and exhausts out the rear vent into the rack.This allows the unit to be used in either negative or neutral pressureracks. The stainless steel ball bearing fan is a special extra quiet version to keep the unit's overallaudible level below 44 dB. TheStatus connector provides aninterface with optional computer software providing loss of AC and low battery status as well as remote shut down capability. The UPS Remote Control and PDU Remote Control connectors provide aninterface to optional remote display/control panels. The RJ45 LAN port provides an SNMP/HTTP interface forvarious UPS parameters and control of the load outputs. Internal software functions include the ability to Sequence Loads of Startup and to Shed Loads for either Overload, or Overtemperature or to lengthen battery run time (when used with battery modules). These functions follow a user defined priority lists and schedules. The batteries in the optional battery modules are maintenance free with immobilized electrolyte and areconstructed of flame retardant materials. 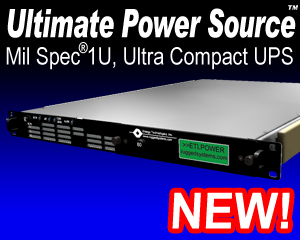 For more information, see the BatteryTechnology section.See the Power Distribution Units section for a listing ofstand alone PDUs. See the N3 Series for aversion of UPS without the integrated PDU and remote control. Overall, the Rugged Power line is uniquely qualified for critical systems combining advanced modular designfeatures with highly reliable construction.